So I’m thinking, who at all would want to be the criminal in the witness stand at the law court??? I mean, at least you would want to be the lawyer, right?? You see, there is this inherent longing in every man that compels him to want to be in control every time. Not having control or the final say in a particular situation is usually misinterpreted as weakness. Therefore, most people would want to be judges. 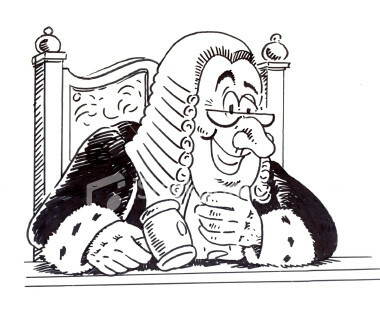 Basically, it is the judge’s words that count most at the law court. But I believe it doesn’t take a Master’s Degree in Rocket Science for one to realize that you don’t always get what you wish for. So though being a judge is pretty cool, it is totally far from the refrigerator to be a judging Christian. Christians are not supposed to judge. If there is any role we are supposed to play as Christians that has a relationship with any of the positions in the law court, it would have to be WITNESSES. Remember when Jesus said we should be witnesses? So we are supposed to go out, witness to people, as in tell them what we have seen, heard or experienced in our walk with God. That is pretty much our job. When this is accomplished, our work is somewhat done. Afterwards we can have God work on the people we have witnessed to. You would realize that if we could just do this, there would be no reason for unnecessary arguments and exchange of filthy words. But hey, sometimes we meet the most annoying people when we go out to evangelize. You know, the kind that profess to be the repository of every biblical revelation but in actual fact know nothing. I believe the bible is 20 times bigger than it looks, so anybody who talks or acts as if he is privy to every knowledge in it is exposing his ignorance of it. Though such people may want to argue with us, as witnesses we have to just present our case and watch the lawyer (JESUS) defend the case based on the evidence we have provided. Knowing this, so what makes some Christians exceedingly judgmental? I believe being judgmental is simply one of the fruits of believing that one’s hard work earned him his position. Well, if you are like me, and you know in the depths of your heart that a filthy rag is the purest state your PERSONAL righteousness can ever attain, you would think twice before judging anybody. I know, there is that subtle judgment I pass with my eyes though. Don’t give me that judgmental look either, you probably do it too. Well it is wrong. We have no right to judge. The bible actually says in the book of Romans 14:4 that ‘How dare you judge another man’s servant?….’ in case you do not know, this is enough deterrent for me to desist from passing either pronounced or subtle judgments on people, especially since I am not their master. JUDGMENTAL STATEMENT>>> You are a thief and all thieves go to hell. Well, it is clear here. The first example seems to be more aimed at correcting the individual involved. The second one on the other hand, expresses some sort of finality. As in ‘You are a thief…’. Maybe that is true, but this also makes the speaker of these words a judge. God does not like Judgmental people. Being judgmental is equal to staging a coupe d’état in heaven, considering the fact that there is the judgment throne of God and He has not occupied it yet. So for a mere mortal to elevate himself to that level and usurp God’s position, it is totally abominable. So yes, there is the need for rebuke and correction but while we are at it, can we not pass judgment on people? The irony of the situation is that those who normally utter those toxic words (‘Don’t judge me’), are the worst culprits of the crime. Nowadays, those words have become some sort of a gag people are putting into the mouths of Christians to prevent them from speaking the truth. Certainly not some of us. We need not compromise our stance in Christ just to fit in. We need not lower the standards either. When something is wrong, we have to say it and if possible not be a part of it. It would be better for us to state emphatically how wrong something is rather than play along with our conscience troubled. Reblogged this on musicalwrits's Blog.